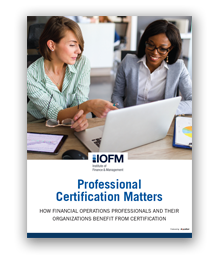 Over the last 2 decades, over 25,000 financial operations have benefited from successful completion of one of IOFM’s premier certification programs. Recently, IOFM’s staff spoke with a panel of industry experts to hear first hand about their experiences with certification for themselves and their teams. Download the new “Professional Certification Matters” report to read about their insights, feedback and first-hand experiences.